Ford Tops Resurgent U.S. Car Industry, 2013 Sales Results Show : The Two-Way Ford and GM are calling 2013 the best year for U.S. auto sales in at least five years, as they report double-digit annual gains. Chrysler reported an increase of 9 percent, its strongest year since 2007. Ford says it sold the most F-series trucks since 2006. 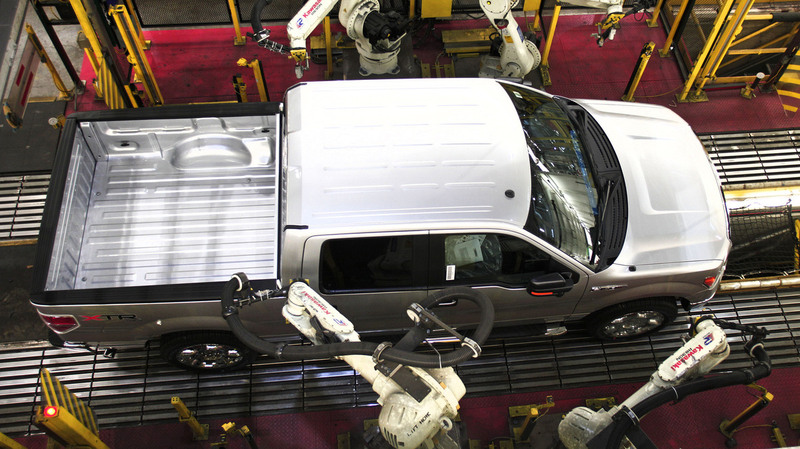 Here, a 2014 F-150 goes through quality control on the assembly line at Ford's Dearborn Truck Plant. Ford and GM are calling 2013 the best year for U.S. auto sales in at least five years. On Friday, they reported double-digit annual gains, while Chrysler reported an increase of 9 percent for its strongest year since 2007. Retail sales were up 14 percent in 2013, as Ford sold 2,493,918 vehicles. For the year, cars rose 12 percent and utility vehicles went up 13 percent; trucks were up 17 percent. In each of the past eight months, the company has sold more than 60,000 F-Series trucks. It finished the year with 763,402 sold. The strongest overall sales gains were seen in the West and the Southeast. "Ford is best-selling brand for fourth consecutive year," the company says. The company's dealers "delivered 2.8 million vehicles in the United States in 2013," GM says. Retail sales rose 11 percent compared with 2012. GM's Chevrolet brand had 1,947,125 total sales, on annual growth of 5.2 percent. The strongest annual growth was seen at Buick, with a yearly rise of 13.9 percent, and Cadillac, with 21.9 percent. "Combined sales of GM's mini, small and compact cars increased by 10 percent," GM says, "bolstered by best-ever sales of the Chevrolet Sonic [85,646 vehicles] and Cruze [248,224 vehicles]." The company's Volt hybrid vehicle finished the year with 23,094 sales, a drop of 1.6 percent from 2012. Annual sales for Chrysler Group were reported at 1,800,368 vehicles. Car sales rose 11 percent, while truck sales were up 8 percent. Chrysler's fastest sales growth was in Ram Trucks, which rose 22 percent for the year. The company saw double-digit sales gains for three Jeep models: the Wrangler (rising 10 percent to 155,502 vehicles), Grand Cherokee (up 13 percent to 174,275), and Compass (up 32 percent to 52,993). "Dodge brand sales were down 9 percent in December," the company says, "but full-year sales in 2013 were up 14 percent on strong Dodge Dart, Dodge Durango, and Dodge Challenger sales." Chrysler's Fiat brand slipped by 1 percent compared with 2012; its flagship Chrysler brand did worse, losing 2 percentage points. Chrysler has been in the news this week, as Fiat arranged to take over the remaining portion of the company that it did not control after reaching an agreement with a United Auto Workers health care trust that has owned 41.5 percent of the company. "The agreement will cost the Turin-based company about a 10th the amount that then Daimler-Benz AG paid for Chrysler 15 years ago," Bloomberg reports.